Director – Steve Sekely, [Uncredited Additional Scenes – Freddie Francis], Screenplay – Phillip Yordan, Based on the Novel by John Wyndham, Producer – George Pitcher, Photography – Ted Moore, Music – Ron Goodwin, Special Effects – Wally Veevers, Makeup – Paul Rabiger, Production Design – Cedric Dawe. Production Company – Security Pictures. Sailor Bill Masen is in hospital for an eye operation. With his eyes bandaged, he is unable to witness a freak meteorite shower that occurs that night. When he wakes up in the morning, Masen finds London in chaos with the entire populace having been blinded by radiation from the meteorite shower. The shower has also brought with it triffids, a form of ambulatory, carnivorous plant that now emerge to prey upon the helpless populace. Gathering a small group of seeing survivors, Masen makes his way across Europe fighting off the triffids and searching for survivors to reorganise civilisation. In the 1950s, British author John Wyndham was for a time regarded as a successor to H.G. Wells. Wyndham had considerable success with novels such as The Day of the Triffids (1951), The Kraken Wakes (1953), The Chrysalids (1955) and The Midwich Cuckoos (1957). In effect, Wyndham took the apocalyptic science-fiction of Wells and reworked it into disaster parables for middle-class England of the 1950s. John Wyndham’s books proved very popular in the time, as much with crossover audiences as they were with science-fiction readers. This film of the John Wyndham novel is mostly – and rightly so – lambasted for the complete demolition job it does of the book. The script was from Phillip Yordan a prolific Hollywood screenwriter who wrote a number of Cinemascope religious/historical epics – El Cid (1961), King of Kings (1961) and The Fall of the Roman Empire (1964), and had revealed an equally clod-handed hand for science-fiction with Conquest of Space (1955). The director was Hungarian émigré Steve Sekely, who had made a number of crime thrillers in the 1940s and previously visited genre material with the cheap Revenge of the Zombies (1943). 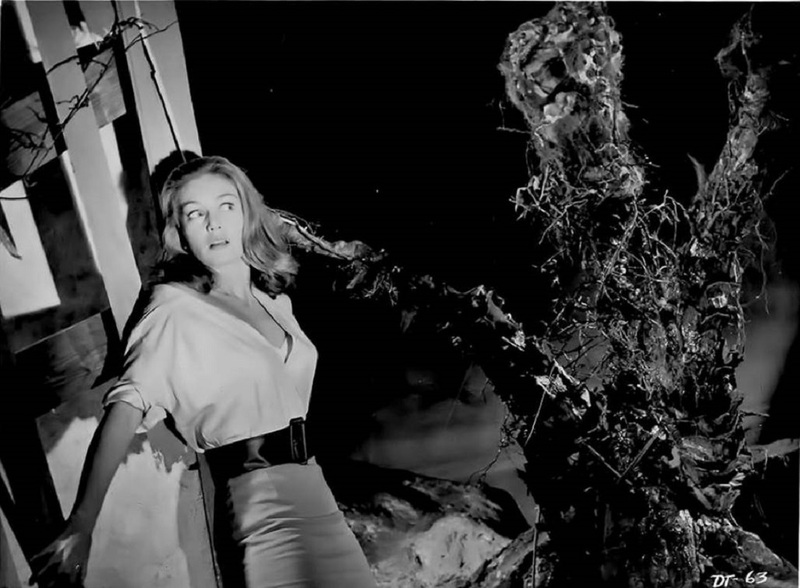 Most insulting of the changes that the film rings up is its need for a happy ending where humanity overcomes the triffid menace. This is hilariously tipped by a prominently featured sign: “Seawater: Warning – Highly Dangerous” sitting in the lighthouse – and it is no cheesier than when Dorothy employed it against the Wicked Witch of the West in The Wizard of Oz (1939). The ending with the masses trouping in a long line up to a church to, what the narrator ominously informs, “give thanks” for their delivery, unhappily looks back to the pious ending of the equally pillaged film adaptation of H.G. Wells’ The War of the Worlds (1953). It is an ending that seems all the more false for the abject cheer in the face of the situation ie. 99% of the world having been blinded. On the plus side, it should be said that The Day of the Triffids has its occasional moments. After a dull opening, the film impresses for a time, even if all that impresses has been taken direct from John Wyndham. The blindness is neatly introduced in a scene where a doctor gets Howard Keel to examine his eyes, confirming the diagnosis of blindness, then sends him to find a non-existent satchel while behind a screen one can see the doctor running up to the window and then the smash of glass as he jumps through. Steve Sekely is even good enough to improvise a series of apocalyptic vignettes of his own invention, most impressively the cutaway to the panic of the passengers aboard a plane about to crash because it has no more fuel. However, by the time the film has reached the continent, any semblance to John Wyndham has been abandoned and the plot peters out into a series of lacklustre incidents. The effects work is of a decidedly variable quality. The opticals work with a meteorite shower flashing down behind and lighting up the interior of the conservatory is fine, as are the patchwork opticals of a burning London. However, when it comes to actually having to build models it seems that the budget has run out, failing at all to show the crashing of the train into the station or the plane into the docks. The triffids move exactly as though they are being pulled along on a low trolley from below camera-height. At least Steve Sekely whips them up into some occasionally effective scares – one scene with a triffid closing in on a skidding car was clearly mimicked seventeen years later by John Carpenter in The Fog (1980). The lighthouse scenes with Kieron Moore and Janette Scott were in fact shot afterwards by Freddie Francis, later to become a genre director for Hammer and Amicus, when the film that Sekely delivered was not up to running length. 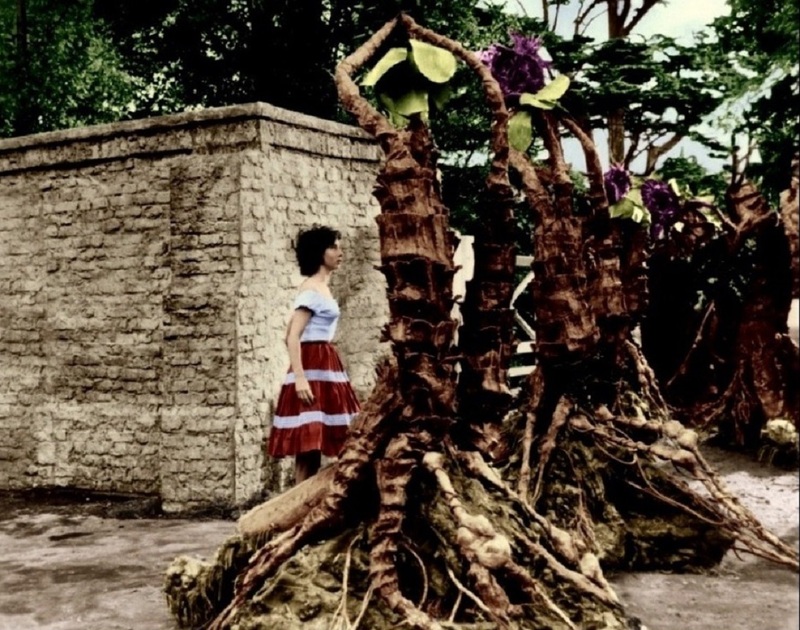 The film was remade as a tv mini-series The Day of the Triffids (1981) by the BBC, which is an excellent adaptation that is much more faithful to the novel and has far more convincing Triffid effects. The Day of the Triffids (2009) was a further tv mini-series remake from the BBC with Dougray Scott as Bill Masen and Joely Richardson as Josella, although this widely departed from the John Wyndham novel. Other John Wyndham screen adaptations are Village of the Damned (1960), from Wyndham’s The Midwich Cuckoos (1957), which was remade as Village of the Damned (1995); the alternate world film Quest for Love (1971), which was remade as the tv movie Random Quest (2006); and the children’s tv series Chocky (1984) about an alien visitor.